International payment systems will have to place a security deposit with the Central Bank equal to the value of two days of transactions processed in the country. This would amount to around $2.9 billion according to Morgan Stanley estimates. 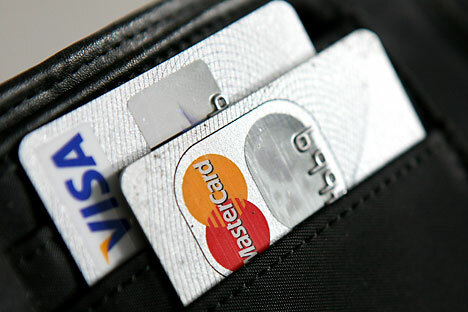 American companies MasterCard and Visa are facing a new obstacle in order to continue operating in Russia under recently approved amendments to the law that mean international payment systems now have to place security deposits on special accounts with the Russian Central Bank. The measures serve as an insurance should the systems stop servicing Russian cards as a result of new sanctions. The cost of the security deposit will be equal to the value of two days of transactions processed in Russia. According to calculations performed by investment bank Morgan Stanley, this means that MasterCard will have to pay some $1 billion and Visa, $1.9 billion. "The payment systems will also have to build processing centers in Russia and pay fines of up to 10 percent of the funds held by the Central Bank in the event of a unilateral denial of services," the bank's report said. These measures can be seen as the Russian authorities' reaction to the decision by Visa and MasterCard to stop processing transactions on the cards issued by the Russian banks that featured on the list of U.S. sanctions against businessmen, who – in the opinion of the White House administration – belong to President Vladimir Putin's inner circle. In particular, the sanctions affected Bank Rossiya, owned by media tycoon Yury Kovalchuk, and SMP Bank, controlled by businessman Arkady Rotenberg. Without any advance warning, in mid-March MasterCard and Visa stopped servicing cards issued by these two banks, while card holders who happened to be abroad at the time had no way of accessing money on their accounts. Under the new law, should a similar situation emerge again, the payment systems will have to pay hefty fines: $100 million for MasterCard and $190 million for Visa. "For this type of business, this is quite a significant amount, all the more so since, as far as I understand, at the moment there is no mechanism for recovering these expenses from the deposit fund, which automatically results in a drop in operators' net profit because these payments will go directly into expenses," says Finam Management analyst Anton Soroko. By way of comparison, according to Morgan Stanley calculations, MasterCard's net sales in Russia are about $160 million a year and Visa's are $350-470 million. The new rules were adopted against mounting political pressure on the companies. In a recent interview for Bloomberg, Russian Foreign Minister Sergei Lavrov said that Russia will be able to find a substitute for Visa and MasterCard should they decide to quit the Russian market. Earlier, President Vladimir Putin had hinted that because of the restrictions that they had imposed on the Russian banks, the U.S. payment systems Visa and MasterCard might lose their positions on the Russian market. However, according to Anton Soroko, objectively, Russia does not have alternative suppliers of this type of services. For their part, he continued, Visa and Master Card cannot afford to lose a market that presents a long-term interest: Card payments in Russia are only now starting to pick up. According to the Russian Central Bank, in 2013, the number of card transactions for the first time ever exceeded the number of cash withdrawals. In the first nine months of 2013, turnover on plastic cards in Russia amounted to just 1,000 billion rubles ($28.8 billion), while the overall amount of cash transactions reached about 8,000 billion rubles. According to Investcafe analyst Mikhail Kuzmin, the amount of card payments for goods and services grows by more than 40 percent every year, with 90 percent of the increment falling on Visa and MasterCard. For the international payment systems, an alternative solution would be to spin off their Russian business into separate entities registered in Russia. This way the companies would be exempt from obeying the U.S. authorities' stipulations regarding sanctions. Meanwhile, besides introducing new rules for the international payment systems, Russia is stepping up work to create a payment system of its own. In early May 2014, Putin signed amendments to the federal law on the national payment system which envisage the creation of a national system of payment cards.